Take Route 23 north to Union Valley Road. Follow Union Valley Road about 6 miles to stop sign. From Stop sign, go to second traffic light. Turn left, travel to fork in road (about 2 miles) go left about 1/2 mile to Warwick Turnpike. Turn left. The park entrance is four miles on the left. Entrance to Wawayanda State Park is not accessible via Cherry Ridge Road. The main park entrance is on Warwick Turnpike and should be accessed from this entrance. The auxiliary entrance from Wawayanda Rd in Barry Lakes is open on weekends and Holidays only from 10am-630pm. The quiet charm of Wawayanda appeals to hikers, campers, swimmers and boaters. Forested hills surround Lake Wawayanda creating a restful backdrop for canoeists, boaters and fisherman, while steep mountains challenge casual as well as serious hikers. A twenty-mile stretch of the Appalachian Trail runs through the park, while the top of Wawayanda Mountain offers sensational views. More than sixty miles of trails are marked in the park. Office Hours: Daily from 9 a.m. to 4 p.m. The gate operating season will be from the Friday before Memorial Day through October 31st. The gate will be open on Saturdays and Sundays only from 10 a.m. to 6:30 p.m.
On 3-day Holiday Weekends, the gate will be open on Friday, Saturday, Sunday and Holiday Monday from 10 a.m. to 6:30 p.m.
For the 2018 season, the gate will be opening on Friday, May 25 at 10 a.m. This area encompasses several forest communities including swamp hardwood, hemlock-mixed hardwood and chestnut oak forest communities. This is a key location for observing the state endangered red-shouldered hawk, with a 360-degree view of the surrounding northern highlands. The topography of this ravine is one of high relief with 300-foot increases in elevation from Doublekill Creek to surrounding hills. The hemlock-mixed hardwood forest provides a cool shady break for hikers on the Appalachian Trail, which is located along the western boundary of the natural area. This natural area features an Atlantic white cedar swamp, mixed oak-hardwood forest and a glacially formed spring-fed lake and is habitat for the red-shouldered hawk, barred owl and great blue heron. Visitors may choose from several trails, including a scenic walk around Laurel Pond. 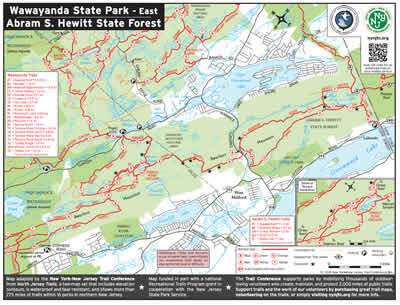 Wawayanda State Park consists of over 60 miles of well marked trails. The trails are not ADA accessible. A 20-mile section of the Appalachian Trail follows the varied terrain of the park. 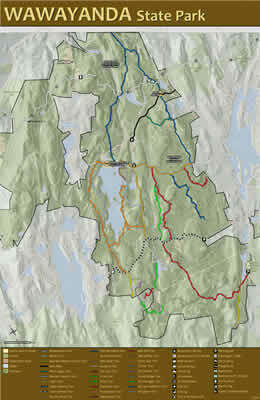 This trail's designated use is restricted to hiking only for its entire length from Maine to Georgia. White blazes mark this narrow and sometimes very rocky trail. Along Wawayanda Mountain are outstanding views of the surrounding landscape. 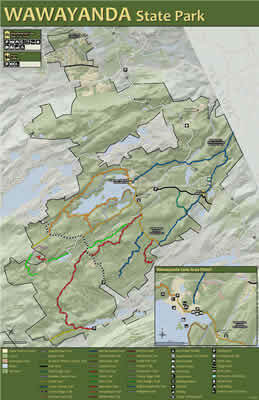 The 70-mile segment of the Appalachian Trail within New Jersey is maintained by the New York-New Jersey Trail Conference. 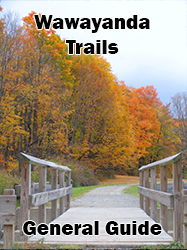 A brochure regarding New Jersey's portion of the trail is available at the park office. 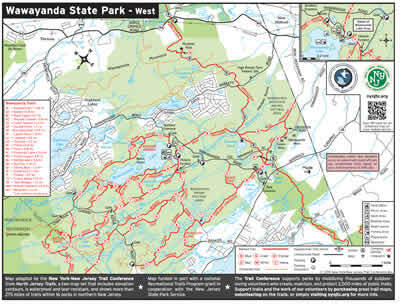 In addition to the Appalachian Trail, there are more than 60 miles of marked trails within Wawayanda State Park. The varied terrain and natural features offer equal opportunities for both the casual and experienced hikers. Pet Friendly Campsites please click here for details on sites that are designated Pet Friendly, license and innoculation paperwork requirements and additional cost. All 4 group sites are pet friendly. Group Campsites: Four group sites with a clivus restroom. Water is not available at campsites; it must be carried from the main office building. Open April 1 to October 31. Campsite 1 accommodates up to 15 people. Fee: NJ Resident $30 per night; Non Resident $60 per night. Campsite 2 accommodates up to 35 people. Fee: NJ Resident $70 per night; Non Resident $140 per night. Campsite 3 accommodates up to 25 people. Fee: NJ Resident $50 per night; Non Resident $100 per night. Campsite 4 accommodates up to 10 people. Fee: NJ Resident $20 per night; Non Resident $40 per night. Firewood available for purchase at park office. Lake Wawayanda and Wawayanda Creek are stocked with trout and Landlocked Salmon. Other variety of fish found within these waters are: Yellow Perch, Largemouth Bass, Pickerel, Catfish, Sunfish, Black and White crappies and Bowfin. The NJ Division of Fish and Wildlife introduced Landlocked Salmon to Lake Wawayanda to provide anglers with an opportunity to fish for this unique coldwater sport fish close to home. Only a handful of deep lakes in New Jersey have suitable year round habitat for coldwater fish like trout and salmon. Lake Aeroflex in Kittatinny Valley State Park also received the Landlocked Salmon. Hunting is permitted in designated areas of the park. Deer, grouse, squirrel, turkey, rabbit, raccoon and woodchuck may be hunted with bow and arrow, shotgun and black powder firearms in their appropriate seasons. Hunting is subject to the New Jersey Division of Fish and Wildlife regulations. Picnic areas are located along the north shore of Wawayanda Lake surrounding the lake-oriented activities and are adjacent to the boat house and boat launch facility. Charcoal fires must be confined to the metal grills that are provided at the sites. Visitors may also bring their own grills, which are subject to the approval of a park official. Wood fires are not permitted. A boat rental facility and launching ramp are located near the beach and picnic areas. Canoes, rowboats (with or without electric motors) and paddleboats may be rented at Wawayanda Lake. Privately owned water craft may be launched. Although sailboats and sailboards are permitted on the lake, there are no rentals available in the park. Gasoline motors are not permitted. Boathouse 973-764-1030. Boathouse is open from Memorial day weekend through Labor Day weekend weather permitting. NJ Boating Rules & Regulations pertain to Wawayanda Lake at all times. Each person must have on a wearable Coast Guard approved Personal Flotation Device. Alcoholic beverages are prohibited. Swimming from boats is prohibited. Swimming is permitted in the designated swimming area while lifeguards are on duty. Please check our swimming schedule prior to your visit. Swimming hours are 10 am to 6 pm. Adjacent to the beach visitors can access facilities with changing areas, restrooms, a first-aid station, and a food concession where food and beach supplies may be purchased. Please be advised all Baptisms and other Religious swimming events require a permit and a reserved date. Please contact the park office (973) 853-4462 for a permit and further information. At an elevation of 1,140 feet above sea level, Wawayanda State Park receives great accumlations of snow in the winter months. A number of winter activities are permitted on designated trails and various areas within the park, including cross-country skiing, ice fishing, snowshoeing and snowmobiling. For more information, contact the park office.